GSM Arena’s Nokia Lumia 800 battery test. 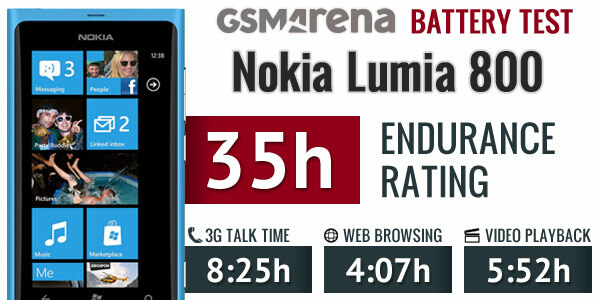 Here’s GSM Arena’s test on the battery life of the Nokia Lumia 800. It has an endurance rating of 35H. That’s 4hours shy from their results with the Nokia N9 so I guess that’s pretty good if that’s what they got (in terms of relative usage). Also note that an update was made available this week, rolling out in availability over the next two weeks which has some “charging improvements”. They ask whether the update was there. I think in fairness, they test what was available at the time, so if Nokia couldn’t push the fix for battery at launch, well, tough luck Nokia. Hopefully Lumia 710 and 900 will fare better, though having said that, my battery life is fine on my Lumia. I get over a day at least and I always charge nightly. Cheers AndreC for the tip!